Buck knife display from hardware store counter top. Vintage and genuine original display from about 1960 to 1970's that is about 14" X 11" X 9" in excellent condition. It would be used to display knives and has storage in the back for extra back stock. It is marked on the top center Buck Knives with a metal plaque and is wood stained walnut in color and with some genuine walnut in the frame. The knife display behind clear glass is an burgundy color. The glass has cloud reflections showing and is clear without marks or shapes. We photographed the display outside on an over cast day with clouds. 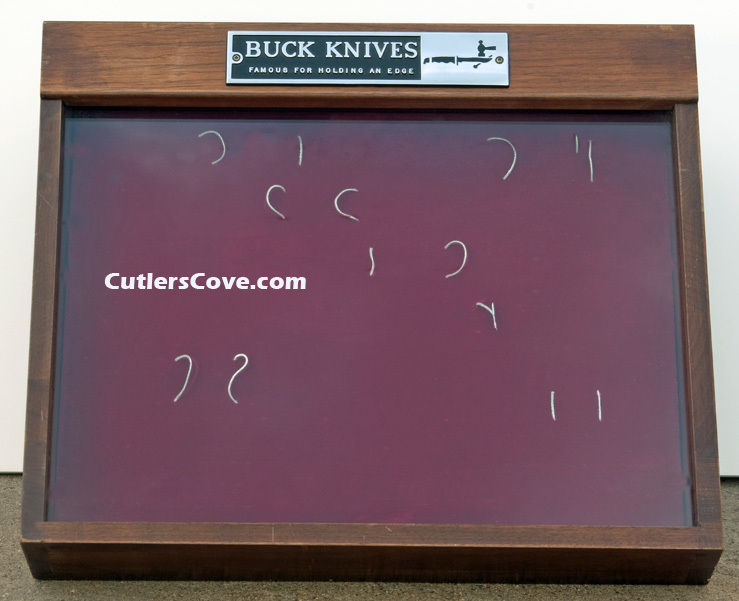 Metal plaque on top: "Buck Knives Famous for Holding an Edge"
CutlersCove.com logo type is on the photo not on the knife display. This means when you get the knife display only the orginal factory logo is there. In the burgundy area there are elastic loops to hold the knives. The back side is removable by sliding it up and out of the back channels to reach the storage area. All are original. One of the best ways to show your knife collection. 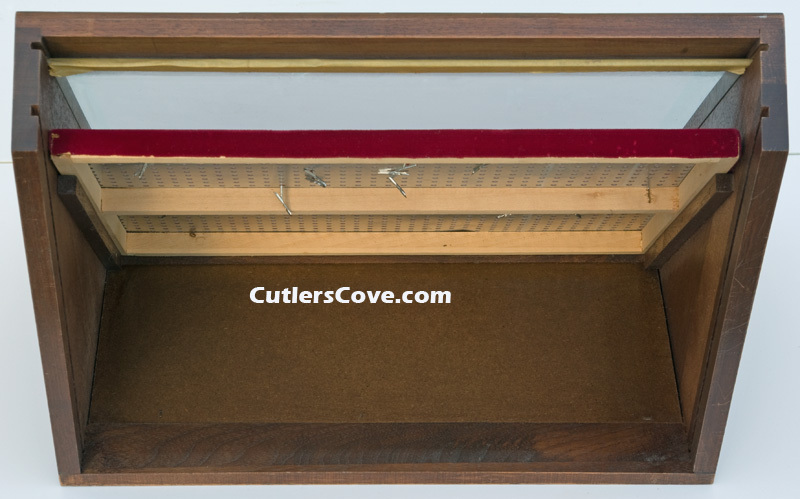 Display it inside an original manufacturers knife display. There are scratches and rubbed places in the wood all over the display but nothing is loose or missing. The unit has not been repaired and only lightly cleaned with a dusting cloth. 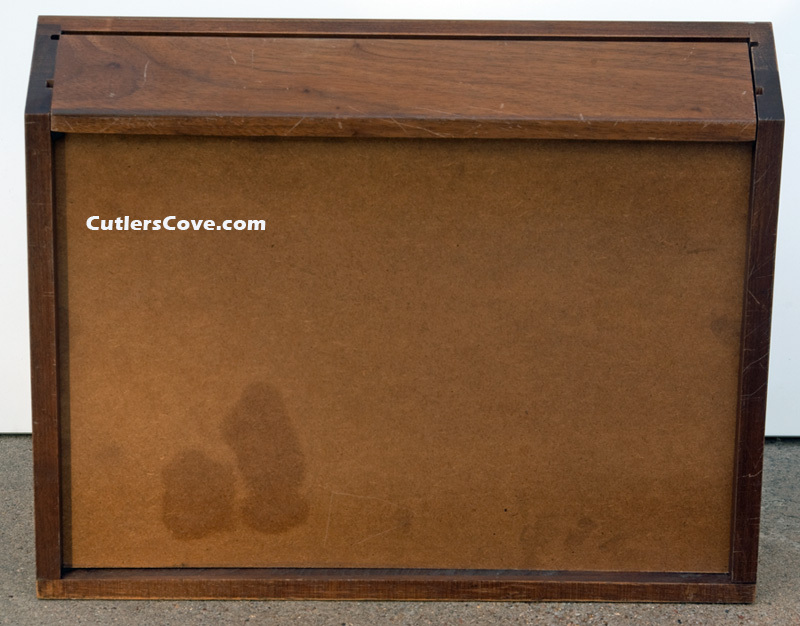 It is in as found vintage original condition and has been in the owner of CutlersCove.com collection for about 15 years. Many people use old and vintage knife displays for decoration in homes, offices, log cabins, man caves and to highlight their knife collection. Knife displays are a great way to embellish your space. This is not a common display but a piece of knife history from the USA. Vintage and genuine original Buck knife display from hardware store counter top. Original display from about 1960 to 1970 that is about 14" X 11" X 9" in excellent condition. A heavy and over size packaging fee applies to this product. $7.50 will be added to the shipping cost. We have been shipping knives and cutlery related items for over 12 years and we do a great job making sure your item arrives to you in same condition as it left our warehouse. As a matter of fact we only have had 4 items total arrive in our customers hands with any problems in all the years we have been shipping. Plus we insurance each package before it leaves our warehouse just in case. Order with confidence! Vintage and genuine original large Buck knife display from hardware store that sets on the floor from late 1990's. Vintage and genuine old Keen Kutter, Simmons Hardware Company Invoice dated Jan. 7, 1907.